Pure Air Systems introduces a new commercial quality, portable air filter system with a true, certified HEPA filter. 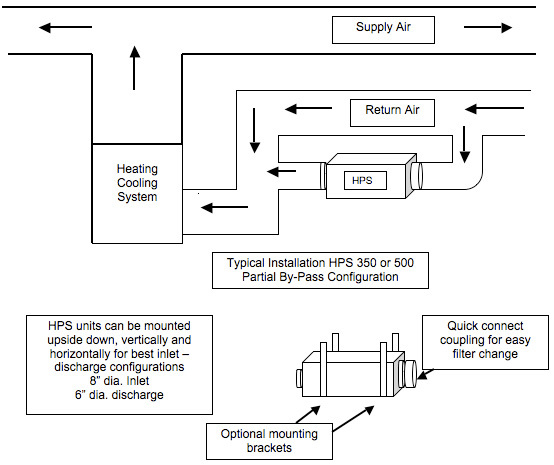 The HPS 500 can be used as a true portable unit or attached to any HVAC system in the partial by-pass configuration. This unit produces over 500 CFM of HEPA filtered air and is ideal for apartments, condominiums, homes, offices, laboratories, hotels or recreational vehicles or any place that good air quality is wanted and small enough to be used in applications where larger filtration systems will not fit. The HPS 500 is only 13” square and 21 ½” long. 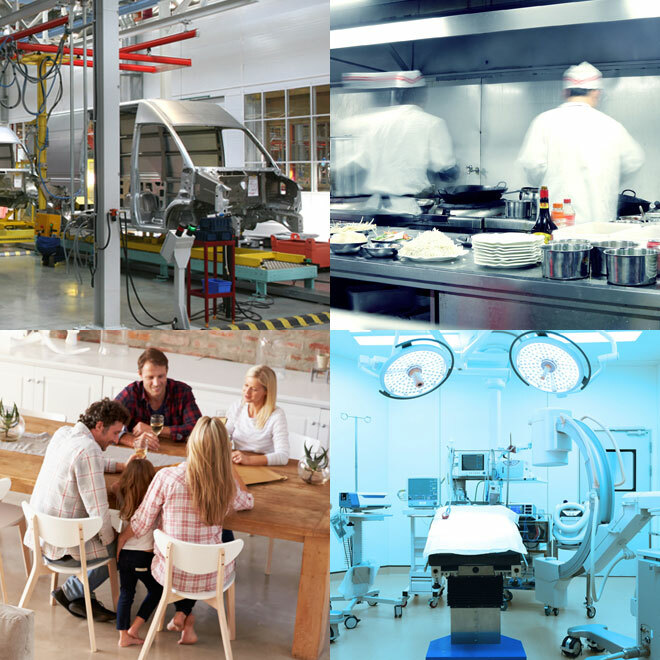 Pure Air Systems introduces a new high performance, commercial quality, portable HEPA air filtration system that shares the same performance standards as our well known line of high volume HEPA filtration systems. The HPS 500 unit is only 13” square and 21” long and produces over 500 CFM of air through our certified, 99.99% HEPA filter. It is is one of the most powerful portable HEPA air filtration systems on the market today. The HPS 500 also has a four speed air volume control switch to allow you to match the volume with your specific application or room size. The HPS 500 unit incorporates a combination ring panel prefilter/carbon media filter along with the certified 99.99% at 0.3 microns metal framed HEPA filter. The unit has a four speed selector switch to allow for four different air volume adjustments from 200 CFM up to 500 CFM. Each unit has a lighted rocker on/off switch and a 12’ power cord with grounded plug. Each unit uses an EBM blower/motor assembly that is rated for 500 CFM. The HPS units are designed so the blower/motor assembly can be easily changed in the field if you need to adjust for volume changes in applications or replacement if necessary. The HPS 500 series units are designed to attach to any forced air ducted, heating/cooling system in the partial by-pass configuration. 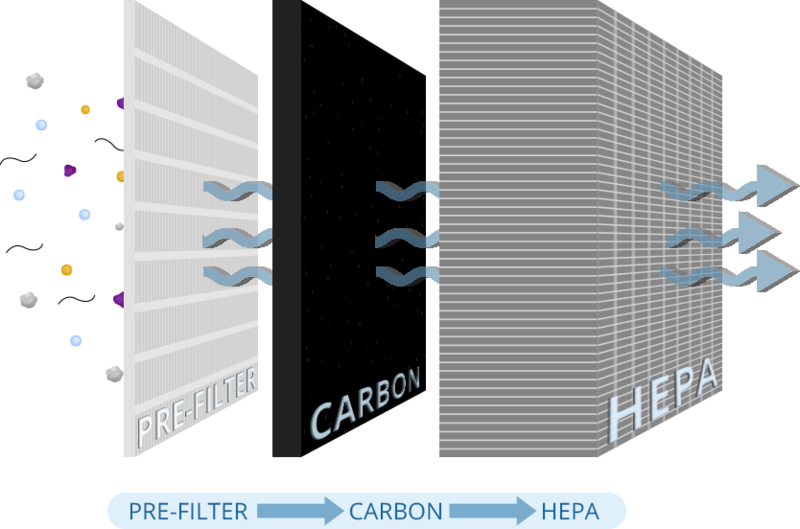 The same process we use with our larger HEPA units. A special duct connection adapter kit is included with the HPS series units when used in conjunction with the HVAC unit. When running at the 500 CFM speeds in this configuration this small unit can provide 24 to 48 air changes per 24 hours in moderate sized homes and offices. The HPS units have a very small footprint. They are 13” square and 21” long and weigh less than 30 lbs. As a result these powerful units can be installed in areas and applications where our larger units will not fit….and installed for less than half the cost of our larger units.